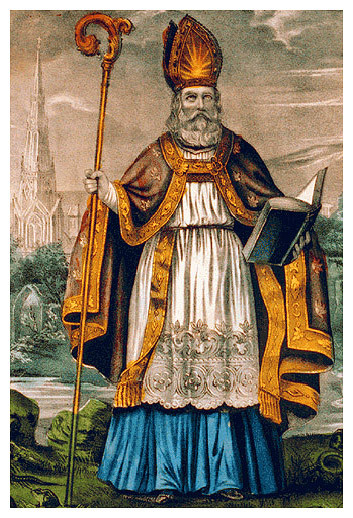 St Patrick (387- c. 460AD), the patron saint of Ireland was brought here as a slave from Roman Britain. The Romans took control of Britain in the period 43-410 AD. They built roads and organised towns with public buildings and public baths at the centre. People now moved from hill forts into the towns. There was a huge economic boom. Jewellery, pottery and other items were mass produced or imported. The Romans were pantheistic (believed in a number of gods) and were tolerant of other religions and even worshipped local gods. They had a problem with Christians who only believed in one God. In the 4th century Constantine became Christian and by the end of that century the Roman Empire, including Britain, is Christian and the pagans are persecuted. In 410 AD the Roman Emperor Constantine finally removed the whole garrison of Britain to defend the Rhine frontier from attack. The cities of Britain were instructed to look to their own defence – leaving the way open for the advance of the Angles and Saxons – and the Irish (never ones to miss an open goal). We get mixed press from the Romans. The astronomy and geographer Ptolemy 2nd century map of Ireland is surprisingly accurate for its time – even naming the tribes in the different areas, including the Iverni in South Kerry. We have evidence of Romans being in Ireland. These include a Roman cremation in Stonyford, Co. Kilkenny (c. 1st century) and Roman coins in Newgrange, Tara and Cashel. Newgrange at the time was devoted to Dagdha, the sun god. At St. Anne’s Well in Co. Meath we have found Samian ware and a Roman brooch. This well is visited at Luganasa, the feast of the god Lug. An ocultist’s stamp was found at Golden, Co. Tipperary. The inscription on it reads “For the son of Marcus Tutianus, an eye salve for his old scars” (the area is called Spittle (Ospidéal – hospital). We also have evidence of Brigantians (North England tribe) at Lambay Island. We also have a promonotory fort at Drumanagh near Dublin, built in the style of the Britains. Extended humations (body full length) have been found at Bray Head (2nd century), accompanied by Roman coins (to pay the ferryman). Leaving offering at wells was a carry over from the Bronze Age. The difference is that now people has lots of things to spend their money on, such as villas etc so people were no longer leaving weapons, only small valuables such as coins. The Irish in Roman Britain – The silver hoard at Balline in Co. Limerick is probably the result of raiding in Britain. We also have a find of 1,500 Roman coins in Ballinrees, Co. Derry. A quote from Britain in 410 AD says “the Irish Sea beats with the sound of Irish oars”. At Silchester in England we have a 4th century ogham stone, which shows there was a least two Irish in the area. In Wales we have a large number of ogham stones and Irish placenames. We have circular stone forts with circular dwellings there. These Irish people in Wales maintained strong links with Ireland through fosterage. Fosterage not only bond families but it also helped in social climbing. In western Scotland we also have Irish settlers who actually gave their name to the country, Scotia (Ireland was named Scotia Major at the time – Scotland was named Scotia Minor). Early in the 1st century people were buried in the foetal position. Inhumations were introduced from Roman Britain in the 1st and 2nd century. By the 4th century we see Christian burials where the body is buried in an E-W direction, with the head at the western end so as to ‘rise up’ facing the rising sun, and also facing Jerusalem. We no longer see grave goods, burial revenues now go to the Church. Innovations from the Roman world to Ireland.